Pot-bellied seahorse, male, carrying eggs. The developing embryos are nourished by individual yolk sacs, and oxygen is supplied through a placenta-like attachment to the male. 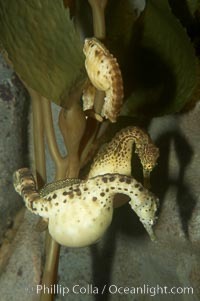 Two to six weeks after fertilization, the male gives birth. The babies must then fend for themselves, and few survive to adulthood.